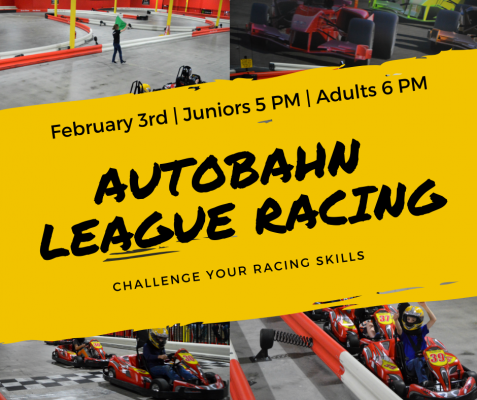 Winter League Racing at Autobahn! Winter League Racing Is Coming! Autobahn Indoor Speedway is offering racers the thrill of competition with weekly League Nights at Hampshire Mall. Winter leagues start Sunday, February 3rd and runs every Sunday night, starting with juniors at 5:00pm, followed by adults at 6:00pm. Racers will compete against others in their own skill level and even have the chance to win cash prizes. League racing is offered at Autobahn four times a year, and the current winter league will run for eight weeks. Stop by on Tuesday, January 22nd from 5:30pm-9:00pm for their Winter League Meet and Greet. Come and meet the competition for the upcoming season and learn about the rules and format from the competition director. There will be food, drinks, and racing! Please contact Autobahn at 413-341-0200 for details.